Blend style with substance. The Admiral LED Cast Aluminum Exit Signs showcase an architecturally sleek, elegant housing. • Features a cast aluminum face with brushed aluminum. 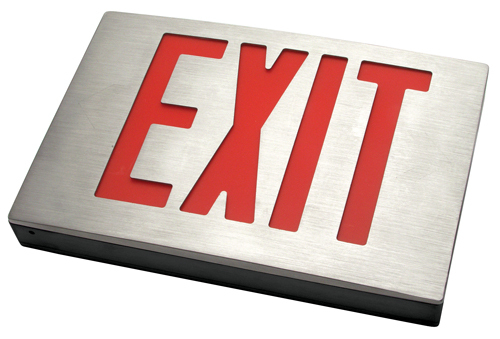 • Spec Grade Exit Signs feature curved edges. • High-quality, ultra-bright LEDs offer premium illumination with very low energy usage. • Quick-snap closure on the front plate makes maintenance easy. • Dimensions include mounting unit. • Need emergency battery backup? Check off the "Battery Backup" icon below and add a battery! Add .5 lbs with the battery backup option. Dual transformers for 2-circuit system. Cannot be ordered if battery backup is needed. Single-Sided or Double-Sided? Select the number of faces for your sign. Red or Green? Select the color of letters for your sign. Do you want to add Battery Backup or additional capabilities? Select from options like remote capability or self diagnostic testing.